As owners of Global Travel Destinations, we receive invitations to check out new hotels, ships and destinations. 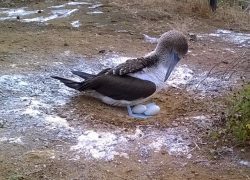 Because we love the Galapagos Islands, and enjoy selling (and sailing) Celebrity Cruises, it was a natural that we jumped at the opportunity to join the Celebrity Xperience, one of the newest ships in the Celebrity family to sail the Galapagos full-time. This is a recap of our journey. 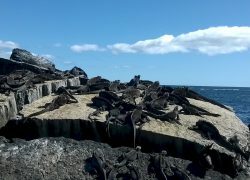 We’ve just arrived at Isla Baltra beginning the sailing portion of our 10-night Celebrity Cruises Galapagos vacation. We’re aboard the Celebrity Xperience, a 48 passenger mega-yacht purpose built for this type of expedition cruising. All guests and luggage are loaded up and we’ve departed Baltra Bay at around 3:30pm. 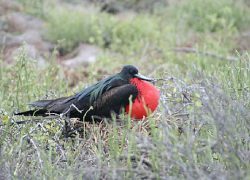 It’s a short sail to North Seymour where we encounter our first frigate birds with their beautiful inflatable red necks. This population of the Magnificent Frigate is one of the largest in the islands. 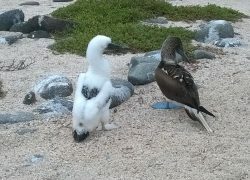 We also find the familiar blue footed boobies, many with young. This is our first “dry landing” where we step off the panga onto a rock or pier – generally without getting wet feet. After another relatively short sail, we’re anchored off of South Plaza, one of two nearly twin islands that make up “The Plazas”, just off the east coast of Santa Cruz. 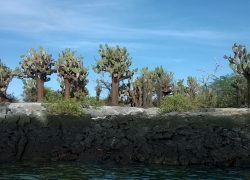 After our dry landing, we follow a trail up through the massive Opuntia Trees (Galapagos Prickly Pear) to a cliff on the far side. 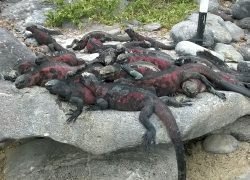 All around are land iguanas and sea lions. Overhead fly Tropicbirds and Gulls. 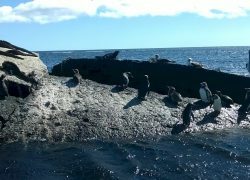 Along the cliffs is a group of sea lion bachelors, loud and crotchety but non-aggressive males that have lost their breeding colony to younger and stronger males. 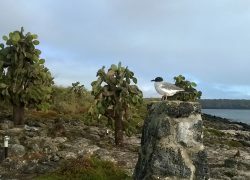 We’re anchored at Punta Pitt on the far northeastern corner of San Cristobal Island the oldest island in the Galapagos. After a wet landing on a sandy beach, we’re confronted by what might be the most aggressive hike of the week. Winding our way up a gorge over slick boulders and sticky sand, we eventually find ourselves high on a cliff overlooking the bay where our ship is anchored. 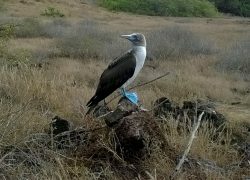 At the top of the cliff we find the only place in the world where Nazca, Red Footed and Blue Footed Boobies nest together. 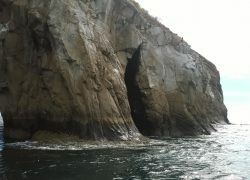 After returning to the ship, there’s an opportunity for a deep-water snorkel before lunch and the ship re-positioning to Cerro Brujo or Witch Hill on the west side of San Cristobal. Here we enjoy a relaxing zodiac ride and an option beach walk or swim. By 5:30 we’re back onboard and have set sail for Floreana Island. 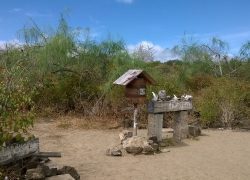 Floreana Island is perhaps the island with the most colorful past. 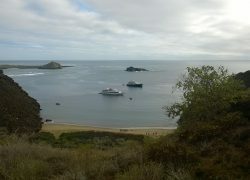 We’re anchored in Post Office Bay, very near Baroness Point. After an early morning zodiac ride, we’re ashore after a wet landing at the original Post Office of the Galapagos. 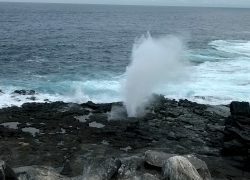 There’s an opportunity for a snorkel off the beach here before the ship re-positions to Champion Islet, considered one of the most beautiful areas for experienced snorkelers and divers. There’s also a panga ride that circumnavigates the islet for those that prefer to stay dry. As the sun dips low in the sky, the ship re-positions once again to Cormorant Point for a wet landing followed by a short hike to a flamingo lagoon. This is our only opportunity to see the beautiful flamingo on this southern loop routing. After a long 14 hour sail last night, we’re anchored in Elizabeth Bay at Isabela Island, the largest and one of the youngest in the Galapagos along with Fernandina in the distance. We’re surrounded by active volcanoes here, with the last eruption in 2015 of the northern “Wolf” volcano. This morning’s excursion is a panga ride deep into a mangrove forest where we find penguins, sea lions, flightless cormorants, sea rays and sea turtles. 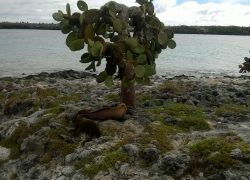 This ranks as the best marine life viewing of any excursion during the week. 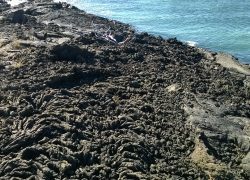 After lunch and re-positioning to Punta Moreno, there is another opportunity for a deep-water snorkel followed by a dry landing and long walk across a young lava field. We’re back to “civilization” at least for a day, anchored in the busy harbor of Puerto Ayora, Santa Cruz Island. 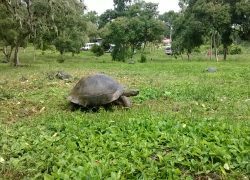 It’s here that we’ll visit the Charles Darwin Research Center and take a bus ride to the highlands for a glimpse of the giant tortoises in the wild. 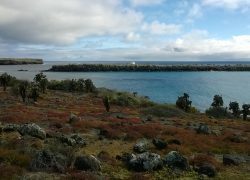 We’re anchored in Gardner Bay on Espanola Island. Our morning begins with a wet landing for a beach walk and swimming followed by optional sea kayaking. 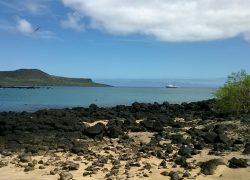 There’s also an opportunity for a deep-water snorkel before the ship re-positions to Punta Suarez, one of the most popular visitor sites in the Galapagos. 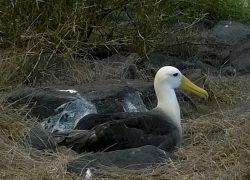 Popular because of the opportunity to walk through the largest Waved Albatross breeding colonies in the world. Though almost comical and seemingly clumsy on land, once in flight their 8 foot wingspan provides agility and grace above the cliffs of Espanola. 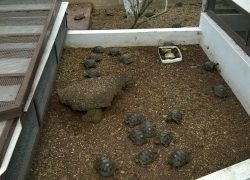 This is the only place on earth you can see this colony between April and December. Followed by an early morning snorkel opportunity, we’re anchored back in the small bay beside the airport on Isla Baltra. There’s lots of hugging and contact exchanging over breakfast this morning. While many of us will be together all the way back to Quito, a few of our group are leaving here on Baltra or at Guayaquil for alternative flights. 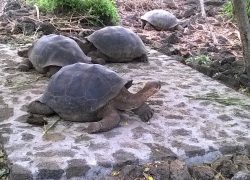 Just as several years ago when we first visited the islands, it’s been a totally unique experience of seeing the wildlife, learning from the naturalists and making new friends from around the world. Special thanks to Daniel, Mari and Christina, our naturalist guides on board. Once again you’ve made this trip amazingly special and unique! Also, a heartfelt thanks to the Celebrity Xperience crew – you’ve made this experience one-of-a-kind and became part of our new extended family.